Now here's a knife with some mighty impressive roots. It was brought to market back in 1980 by none other than the man whose last name goes on each of Gerber's products. Pete Gerber was the first knife creator to envision the merits of using all-synthetic materials in the handle. Now here&apos;s a knife with some mighty impressive roots. It was brought to market back in 1980 by none other than the man whose last name goes on each of Gerber &apos;s products. Pete Gerber was the first knife creator to envision the merits of using all-synthetic materials in the handle. He and knife designer Blackie Collins aimed to deliver lightweight performance that had not been seen before in a knife this all-out rugged. 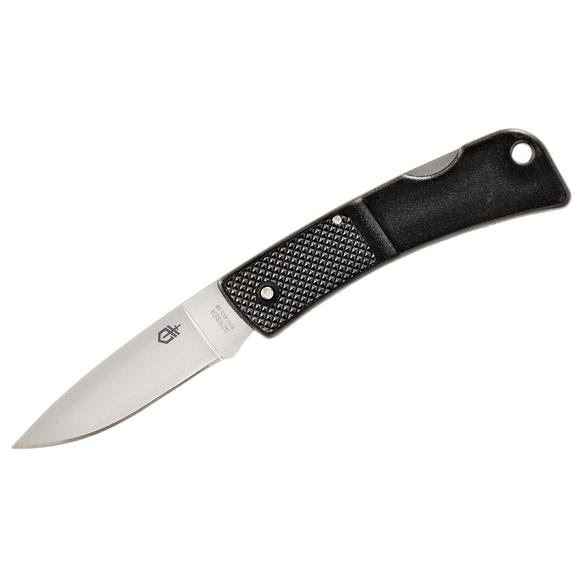 The Gerber L.S.T. is the smoothest of operators, with a mechanical action that just feels good and satisfying when you open and close the blade, which happens to be made of 400 series stainless steel. The L.S.T. Fine Edge musters a mere 1.2 ounces on the scales. Yet, when you feel that easy grip, there&apos;s no question that Pete Gerber&apos;s big idea is one for the ages. 420HC stainless steel drop point blade. An improved form of 420 that works well with high production tooling; commonly used by Gerber and other major brands. Content: Carbon 0.5-0.7%, Manganese 0.35-0.9%, Chromium 13.5%. A blade design made popular in handmade hunting knives by Bob Loveless beginning about 1969, used earlier by Randall and others. Characterized by a slow convex-curved drop in the point. The drop-point format lowers the point for control, but leaves the point extremely strong. It&apos;s usually coupled with plenty of belly for slicing, making it ideal for hunting knives. An extremely good all-around format that also shows up on tactical and utility knives. Many of today&apos;s thermoplastic materials are improved by adding chopped glass fibers. Often as much as 40% of a product may be glass. Adds great strength.